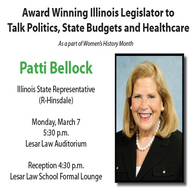 Patti Bellock is in her seventh term as a state Representative. She continues to advocate for improvements in education, juvenile justice, healthcare, developmental disabilities and mental health, as well as Great Lakes water issues. She has received numerous state and national awards including being named Legislator of the Year by twelve statewide organizations. She recently sponsored the major Medicaid Reform bill which has become a national model. Representative Bellock was Chairman of the bipartisan Illinois Women’s Caucus and honored to be one of 21 legislators selected to serve on the recent Impeachment Committee. She serves as chair of the Medicaid Reform Committee and the Commission on Government Forecasting and Accountability. Nationally, she serves on health and human service committees with NCSL, ALEC and is Midwest Director at Women in Government in Washington D.C.